How Much Freedom Should We Sacrifice To Be Safe? Emily Benedek is a journalist and author of four books. Her articles and essays have appeared in Newsweek, Rolling Stone, The New York Times, The Washington Post, Glamour, Details, Life, and on National Public Radio. She spent a year following an FBI agent working counterterrorism and wrote about an F15-C fighter pilot who flew in Operation Shock and Awe. She is a graduate of Harvard College and lives in New York City. Red Sea is her fiction debut. 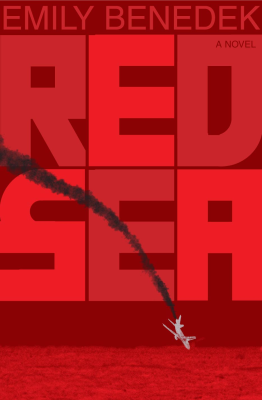 RED SEA is a work of fiction -- except that it's all too real. It brings you into the life of a working counter-terror officer, how he thinks, what he fears, what he'll do to catch his prey. Offering a deeper understanding of the religious and cultural underpinnings of Islamic terrorism and what's required to thwart it, RED SEA reveals startling new details of the 9/11 attacks. Throughout this riveting novel the author also provides an eye-opening examination of the gaping holes in our nation's security. Three commercial aircraft explode at cruising altitude, each thirty-thousand feet above open ocean, ensuring that the most significant clues to this apparent act of international terrorism are lost. When a fourth plane bound for London seemingly breaks the pattern, crashing into a forest outside of Munich, the grisly debris offers intelligence and aviation security experts their first solid clues. From its gripping opening to its tense final pages off the coast of New York City, Emily Benedek's new novel RED SEA (St. Martin's Press; $24.95 hardcover/$31.00 Canada; September 2007), offers readers a rare and fascinating peek inside counter-terror investigations, the fanatical terrorists they're after -- and our alarming vulnerability. A journalist whose articles and essays have appeared in Newsweek, Rolling Stone, The New York Times, The Washington Post, Business Week, and NPR, among others, Benedek is also the author of three highly-regarded nonfiction books. Drawing on her research in counter-terrorism and aviation security -- as well as extensive interviews with former and current officers and soldiers of the Israel Defense Forces, U.S. Air Force, U.S. Army, and special agents of the FBI -- Benedek has crafted a thrilling work of suspense that plays out a real-life scenario that terrifies American security officials: an attack on a U.S. seaport. The novel's hero, Julian Granot, a retired Israeli commando and security expert called in by the state of Israel to investigate the airplane crashes, is based on one of the author's own highly placed, real-life sources. Marie Peterssen, an American journalist, agrees to become Julian's hidden asset, sharing details of her own reporting in exchange for access to high-level intelligence. When Marie gains the confidence of American FBI agent Morgan Ensley, the three slowly realize that the crashes were intended as a diversion to throw investigators off track, and that a bigger attack is in the offing. Creative investigations and special intelligence-gathering techniques, a hallmark of the Israel Defense Forces' counter-terror successes, lead the three to Mansour Obaidi, a Muslim international shipping magnate with Messianic ambitions. As a container ship packed with a rogue tactical nuclear weapon makes its way to New York City, the three must work together to disrupt Obaidi's brilliant plan.